The quality of the BIRA-IASB GOME BrO product has been tested in several ways, mainly as part of a THESEO-Stratospheric BrO project (coordinator, M. Van Roozendael). GOME BrO validation activities included direct comparison of GOME analysis results performed at different Institutes (University of Bremen, University of Heidelberg, and SAO/Harvard University). BrO vertical columns derived from GOME were also compared to BrO measurements from ground-based and balloon instruments at different locations and time [Van Roozendael et al., 2002]. In addition, more direct comparisons of BrO differential slant column amounts simultaneously measured from the ground and from GOME were performed using BIRA-IASB measurements at the NDSC station of Harestua, Norway, 60°N. Comparison between BrO differential slant columns amounts (taken relative to 1st January on each year) simultaneously measured by GOME and by the spectrometer operated by IASB-BIRA at the Harestua station (Norway, 60°N). The large seasonal variation of the measured BrO differential slant columns is mainly due to the seasonal variation of the local solar zenith angle. 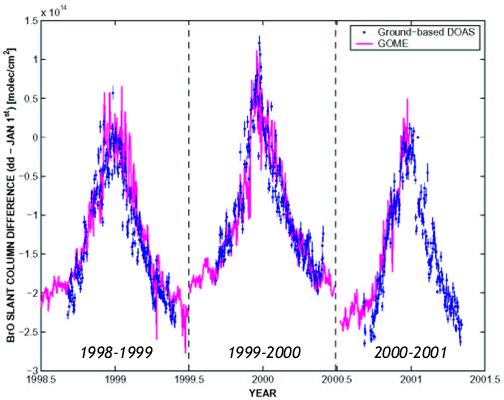 In summary it has been concluded from the different validation exercises performed so far that, when accounting for the BrO diurnal variation, the differences in sensitivity between ground-based, balloon and satellite observations, and the systematic presence of BrO in the troposphere (at levels around 1-3 molec/cm2), measurements from all platforms can be made consistent within their error bars [Van Roozendael et al., 2002].